The Royal Asiatic Society was founded in 1823 by Sanskrit scholar Henry Colebrooke and a group of likeminded individuals. It received its Royal Charter from King George IV in the same year ‘for the investigation of subjects connected with and for the encouragement of science, literature and the arts in relation to Asia’. Throughout the course of the Society’s history, many distinguished scholars have contributed to its work, including Sir Richard Burton (1821-90) the explorer and first translator of ‘The Arabian Nights’ and ‘Kama Sutra’, and Sir Aurel Stein (1862-1943) the renowned archaeologist and Silk Road explorer. 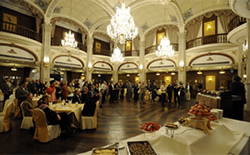 The Society is based in London, with affiliate branches operating in India (Bangalore, Bihar, Mumbai, Calcutta, and Chennai), Sri Lanka, China (Hong Kong, Shanghai, and Beijing), Japan, Korea and Malaysia. In 1857 a small group of British and Americans seeking intellectual engagement in a city dedicated to commerce established the Shanghai Literary and Scientific Society. 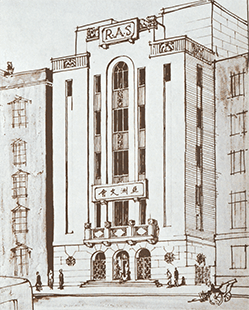 Within a year the organisation was granted affiliation with the Royal Asiatic Society of Great Britain and Ireland, and the North China Branch of the Royal Asiatic Society (NCBRAS) was born. The Society fell into decline following the death of the Society’s first inspirational American president, the Rev. Elijah C. Bridgman in 1861. However Sir Harry Parkes, British Consul, successfully resurrected it in 1864. The Society’s intent was to investigate subjects connected with China and surrounding nations, to publish papers in a Journal and to establish a library and a museum. The Society’s first journal, which was to have a life span of 90 years, appeared in 1858. The Society’s building contained a reading room, library and lecture hall on the ground floor. In 1874 the second floor was opened as a museum with its prime exhibits being stuffed birds mostly shot and donated by local Shanghai sportsmen. The road where the building was located was renamed Museum Road in 1886. Shanghai’s public was again called upon in 1930 when the old building was condemned and demolished. The fundraising for a new headquarters was led by Arthur de Carle Sowerby and George Leopold Wilson. The major individual benefactor was Dr. Wu Lien-the, head of the Chinese Government Quarantine Service. Although enough funds were secured, the effects of the Depression and Sino-Japanese hostilities resulted in delays and in considerable debt after it opened in building to house its library. The RAS continued its work in difficult straits for a few years after the war, but acknowledged that these were its ‘twilight’ years. The Society ceased to function in 1952. 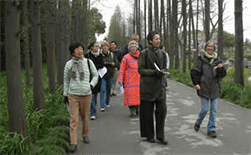 The RAS returned to China in 2006 when a branch was established in Hangzhou. Its activities were transferred to Shanghai in early 2007 and in September that year under the name of The RAS China in Shanghai it formally reconvened the activities of the North China Branch of the RAS. The Society is very aware of the need to build upon its tradition and to embrace the challenges and opportunities to develop its activities and interests for a wide audience today. Apart from offering a broad range of talks and events the Society has resurrected its journal and has established a new library for the benefit of our members, scholars and the public. Our logo was adopted from one of a pair lions carved in granite that sit on top of the former NCBRAS Building in Shanghai. The building’s architect, George Leopold Wilson (1880-1967), who was affectionately known as ‘Tug’ Wilson, was senior partner of Palmer and Turner architects. As a member of the RAS Council, he spearheaded the campaign to raise funds for the building. Many of his architectural masterpieces still stand today, including the former HSBC premises and the Cathay Hotel on the Bund. Our lion honours Tug and his important contribution to the development of the city and to the enrichment of its cultural and civic life. 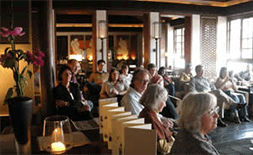 Through our diverse lecture series, focus groups, library facility and publications, RAS Shanghai provides a forum for the development and expression of interests and expertise from within the local community, and from around the globe, to inspire and to enrich cultural life in Asia’s most dynamic metropolis (and beyond).